If you have a business name you're thinking of for your home staging business, you should protect that name on the internet by registering your domain name now. This doesn't mean you're putting up a website, it's just the address you're protecting for now so that it's available when you need it. You can do this for an amazingly low fee of only about $7 for the year at GoDaddy. This is only one of the many tips I share with students in "Staging Diva Marketing & Sales Secrets" which is Course 4 of The Staging Diva Program. Not everyone takes my advice. One student registered her business name and printed all her cards and marketing materials before realizing the name was already in use by someone else and had to redo everything! Another saw her name was available at GoDaddy and didn't register it right away. When she went back a week later, it was taken and she had to pay the person who bought it over $700 to get it back! She would have paid only $7 had she registered it in the first place. I share this with you so you won't make these mistakes. Go immediately to GoDaddy and protect your little "plot of land" in cyberspace! For more marketing ideas consider ordering course 4 of the Staging Diva Program. Better yet take the whole program and I can refer projects to you once you're a graduate! •Does your current work or how you spend your time let you feel you're making a real difference in peoples' lives? •Does your work, or how you spend your days allow you to express your creativity? •Are you still passionate about what you do everyday? •Are you so focused on money and security that you are willing to sell your soul for it? •Do you think anything will change if you keep doing what you're doing? If you answered NO to 3 of these 5 questions, I encourage you to spend a f.r.e.e. hour listening to me talk about home staging. You get this with a listing in the Staging Diva Directory of Home Stagers- saving the 3 to 6 month wait that's common for any new web site to be discovered. Over 20 graduates have joined since the January launch and traffic continues to build. In fact stagingdiva.com now gets more traffic than sixelements.com, a site that is 3 years older! Right now we're discussing things like negotiating commissions, speaking at events, challenges on first projects, helpful resources and more. You are receiving this newsletter because you expressed interest in learning about the business of Home Staging.If you don't want to continue, use the "Unsubscribe" link at the very bottom of this email. I've had three home staging projects recently with no graduates to refer the clients to. They were in Chicago IL and Savage MN. If you're in either of these areas and you weren't sure whether you wanted to proceed with Staging Diva Training, I can tell you that any of these projects would have more than covered the cost! This has been an international year for my business. I staged homes for owners now living in Thailand, Hong Kong and England who had homes back in my city to sell. Naturally, they found my home staging site on the Internet. I was able to sell them on hiring me to take care of all the details of preparing their homes for sale even though we never met in person and they were thousands of miles away. Staging Diva is also going international, with our first students from Australia and South Africa joining this week! They found my home staging training site on the internet. For those of you continuing to resist putting your staging businesses on the Internet, you are really missing opportunities. That's why I created the Staging Diva Directory of Home Stagers. It's the cheap, fast and easy way to get your business hosted on a high traffic home staging site. I do all the work, just send me your copy and photos! If you're unsure whether I can get your staging business exposure and traffic, think back to how you found out about me in the first place. • You get more projects to work on because they are shorter in nature. So, more variety. • Your clients give you creative control because they know they don't have to live with your changes. So, you get to be creative and make the decisions. • Because people stage their homes to make m0ney, you get to work with people who wouldn't normally hire an interior designer or decorator, in other words you have a much larger target market. This is not a criticism of interior design. I've just found key differences that suit my temperament. 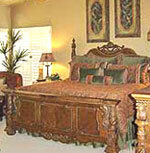 By the way, there are many established interior designers who take the Staging Diva Program. They find the pricing and marketing information I share helps with their interior design business too. I was shocked to see these statistics! In my first year of home staging I made more than an interior designer with 2 years experience. By year two, I made more than a senior designer with more than 8 years experience! I share with my students how I accomplished this, and show them how to do it too, during 10 hours of training in The Staging Diva Home Staging Training Program. Congratulations to LaJeanna Pilant of Alamo Home Staging (TX) who is using what she learned in course 3 "Taking the Mystery Out of a Home Staging Consultation" to stage her first project. It's a $650,000 home involving shopping, staging, landscaping, painting, packing, etc. Congratulations to graduate Jenny Kennedy-Olsen of Urban Lane Designs (AB) who has been invited to speak at the local Home Builder's Association conference in September! Congratulations to Cindy Pickering (FL) who within 5 months of graduating not only built a successful home staging business but was able to sell it when her husband was transferred to another state! She can start up again when she resettles in her new home. Once you know what you're doing, you can run your home staging business anywhere! Congratulations to Della Pitre (NB) on her new staging business, New Look Designs. With two more courses before graduating from the Staging Diva Program Della is already well on her way to a new future! Check out this bedroom makeover from Kelley D'Lima's listing in the Staging Diva Directory of Home Stagers! Congratulations to Kelley D'Lima on starting Redefining Spaces (AZ). Kelley had to decide whether to keep her full time job and stage on the side, or just jump in. Within 3 weeks of completing her Staging Diva Training, she had two projects. When Kelley made more in 5 hours of staging than she used to make working a whole week, she decided it was time to take the plunge. She celebrated Independence Day by quitting her job and committing herself full-time to building Redefining Spaces. Way to go Kelley; it takes courage to step out of your comfort zone and follow your dreams! Even an open-minded client will be thinking about the inconvenience and price tag associated with painting. It's your job as a home staging expert to educate them about why it's important. I had one client with a fuchsia living room that opened into a brilliant turquoise kitchen and dining room. These were the first rooms you saw when entering the house. I knew I would recommend a new color scheme as soon as I walked through their front door. But, timing is everything. I waited until I had completed the rest of the consultation and built a rapport and level of trust. They were proud of their color scheme and had I recommended changing it from the get go, I would have met with considerable resistance. So, three hours into our time together, I acknowledged what a "wonderful job they had done choosing their colors to live". I pointed out that now we were turning their home into a product that needed to appeal to the greatest number of potential buyers. I discussed how strongly people are influenced by color, and how difficult it is to imagine anything else when looking at a room in a strong color scheme. I explained the fuchsia would distract buyers' with the novelty of the color, and that their next distraction would be trying to imagine how their own living room furniture wouldn't work with it. "Bottom line," I said, "instead of walking through imaging themselves just moving in, potential buyers will be talking about how they have to repaint; or even worse, thinking 'I could never live here!' Decorating a home to sell is the art of creating an environment that the maximum number of potential buyers will fall in love with." This was an excerpt from one of the 13 chapters in "Staging Diva™ Ultimate Color Guide: the easy way to pick colors for home staging projects". 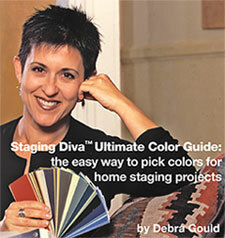 "The Staging Diva Ultimate Color Guide saved me hundreds of hours. Within 45 minutes, I had my own Staging Fan Deck put together. It's easier to carry, less daunting for clients and reinforces my professionalism and expertise." You can order "Staging Diva™ Ultimate Color Guide: the easy way to pick colors for home staging projects"and have it emailed to you within 24 hours. The Staging Diva Training Program is the only Home Staging Business Opportunity featured in Entrepreneur's StartUps Magazine. I have over $36,000 worth of advertising space in The Official Pre-Mover Savings Guide featuring my tips for preparing a house to sell. Written to entice readers into learning more about what a Professional Home Stager can do and distributed by Coldwell Banker and Century 21 agents throughout the US. An excellent lead generator for Staging Diva Graduates as readers contact me for referrals to home stagers in their areas! I shared two design book recommendations with Style at Home readers in June. The best part is I managed to weave the home staging idea into the article (even though they were just looking for design books)! The more we can get the "home staging" concept out there to the public the better. It makes our selling job easier.